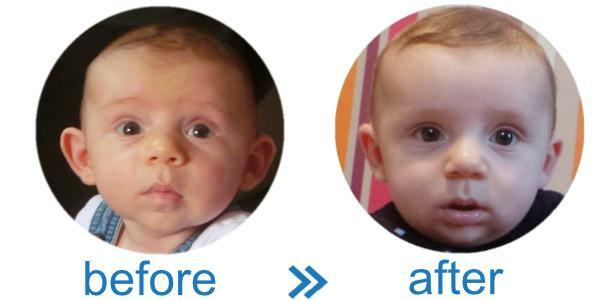 Surgery to correct stick-out or bat ears used to be the most common children's plastic surgery operation in the UK. Funding restrictions mean that it is now rarely permitted under the NHS. Left alone, up to one in twenty children will have prominent ears by the age of 5. Splinting the stick-out or deformed ears of a baby at birth can save the need for surgery, and the playground teasing that often goes with abnormal ears in children. 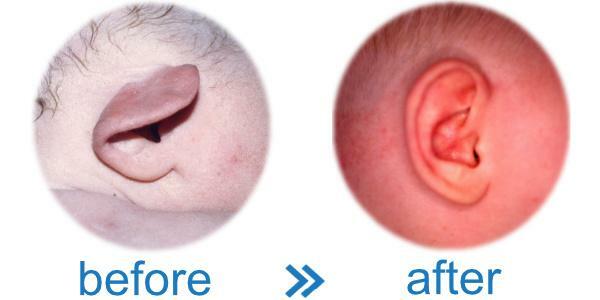 The cartilage framework of a newborn baby's ear is extremely soft and pliable, and many baby ear problems can be fixed at birth without surgery by simple remoulding with small splints called EarBuddies™. 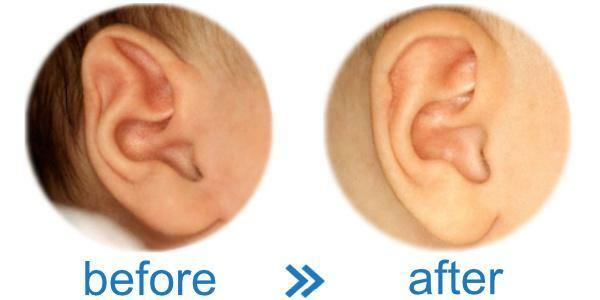 As a general guide, if you can gently reshape baby's ear with your fingers, then EarBuddies should be able to give a permanent correction. 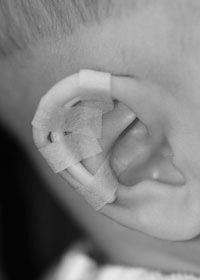 The splints can correct most baby ear problems caused by abnormal or missing folds (Stick-Out Ear, Stahl's Bar, Cup Ear, Cryptotia, Lop Ear, Rim Kink, Stick-Out lobe and a Folded-over Helical Rim). However, the splints cannot replace missing tissue (for example, in microtia or anotia) or guarantee success in all cases. 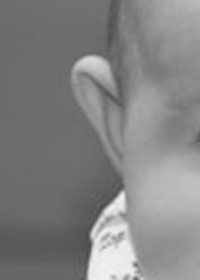 Most abnormal ears are noticeable when baby is born, but about a third of all stick-out ears don’t show until about three months of age, as baby’s head shape changes and the cartilage framework of the ear hardens. And if an ear is easily pushed forward when a baby sleeps, feeds or turns its head, it is likely to become worse in the first six months after birth. Says David Gault, "Too often, parents are reassured by Health Professionals that their child’s ears will look more normal with age, but this is rarely the case. Ear splints should be considered for any baby ear which still looks odd 48 hours after birth. Worse still are the stories from parents wrongly advised that baby is too old for splints, or that the ears stick out too much and that they should wait for (private) surgery. With hospital fees for a paediatric day case stay in London at around £2000, without surgeon’s and anaesthetic fees, even the cheapest operation is beyond the means of most parents." 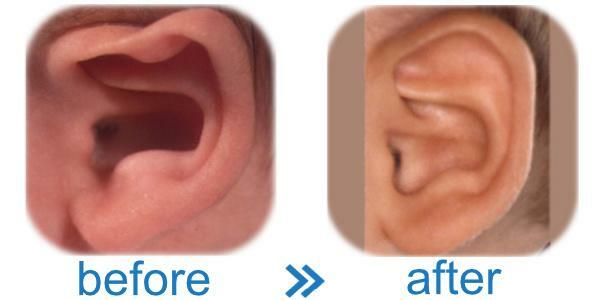 Visit the EarBuddies™ website for more details and results achieved by Early Ear Correction for babies. Ideally splints should be fitted in the first few days of life. At this stage the cartilage is easily reshaped, and because baby's sweat and oil glands haven't started to work, the tapes which hold the splints in place stick well. A newborn baby moves its head little, and cannot reach up to the ears to pull at the splints. EarBuddies splints reshape the cartilage folds in a baby's ears to restore the natural curves which hold the ear close to the side of the head, fixing stick-out ears and most other baby ear problems. When the framework hardens in the remoulded shape, there is a permanent, surgery-free correction. Beware - simply taping the ear back without the splint in place can cause distortion and flattening of the rim, which may not be noticeable until later life. A newborn baby might only need to wear the ear splints for one or two weeks. More perseverance is needed if this “golden period" within a month of birth is missed. Early splintage is best, but even starting as late as 18 months may not be too late, especially if baby is still breastfed, as this keeps the ear cartilage softer for longer. When EarBuddies were first introduced, splintage was thought to be effective only in babies of up to 6 months, but that limit has steadily increased as parents report success in older and older babies. Independent research into ear splinting in Japan shows that it can be effective in much older children and even in teenagers. That said, success depends on flexibility of the cartilage and perseverance of the parents. I only recommend using EarBuddies for babies over 18 months if you are prepared to be very, very persistent. Initially only available in a few key Children's Hospitals around the world, including the Mayo Clinic, Boston Children's Hospital, and The Portland Hospital, London, EarBuddies are now available to parents themselves online. British Journal of Plastic Surgery 47: 573 - 574. British Journal of Plastic Surgery 47 : 575 - 578. European Journal of Plastic Surgery 18: 291 - 292. You and Your Baby Magazine page 72. Christmas Edition of the British Medical Journal 311: 1715. Ear Splintage Face 5: 211-212.